If the trailers and advertisements are to be believed for Catfish, the film is another low budget entry into cinema history that includes Blair Witch Project and Paranormal Activity. The trailers are filled with suspense and intrigue that make no sense once you see the film. The marketing for the film sells it as a true story thriller, in which we should fear for the protagonist’s lives. 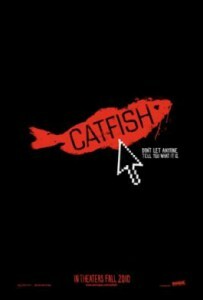 Catfish is a supposedly true story that follows 24-year-old photographer, Nev Schulman. The story initially starts out when Nev receives a painting of a photograph of his that appeared in the paper. The recreation is supposedly created by 8-year-old artist, Abby, who resides in Michigan with her family. Nev and Abby begin communicating, and quickly become penpals. After a while Nev starts befriending the rest of the family through Facebook. The social networking gets him close with mother, Angela, and 19-year-old sister Megan. Unfortunately, Catfish falls prey to its marketing. Going in everyone I knew thought this was going to have some slasher like ending, but instead you are treated to a documentary on the perils of internet relationships. The problem is that due to the mismarketing of the film, you aren’t prepared for a completely different documentary which is actually pretty interesting. When Catfish stands on its own, and assuming the film is all true, it is an amazing look at problems that might occur within our modern social networks. How many people have you met online? How many of them do you think truly represent themselves as they are? The hard truth is that we all present the best of ourselves on the networks, but we rarely show people the faults we have. Catfish shows that people can take that premise ten steps further, and that maybe not everyone is who they seem on the internet. If you go see Catfish, don’t go for a twist ending. Instead, go for an interesting documentary that gives a unique commentary on friendship in a digital age.